This is my yummy brunch before heading out to work following my fast day on the 5:2 intermittent fasting. I don't find that I'm absolutely starving like you might expect following a fast, and I do like to make sure that the first food I eat is clean and healthy, and isn't going to send me off into a sugar high to be followed by the insulin crash later on. 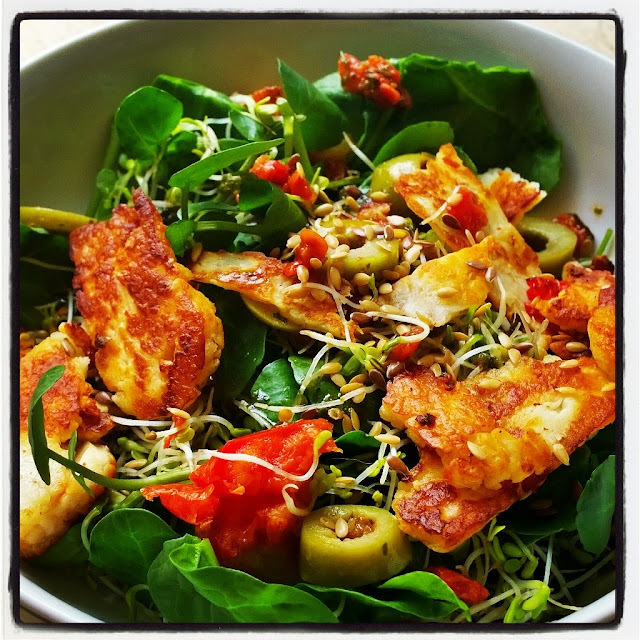 The nuts and halloumi in this will sustain me throughout the afternoon at work, and the sundried tomatoes, olives and splash of vinaigrette make this a super tasty meal which is still low in calories and really healthy.